Ready to raise the bar in your digital marketing? Easily publish alert bars on any Lead Page or webpage to make an announcement, highlight a promotion, or capture email opt-ins. Whether you’re looking for a quick and easy way to tell your visitors about a new product, announce a recently published blog article, celebrate free shipping, share a discount/ coupon, or grow your newsletter email list—alert bars are awesome add-ons to any web page you own. These full-width site banners are one of the best ways to effectively reach your audience, without distracting them from the content they came looking for in the first place. You can deliver a message in a single line of text and your visitors can opt-in or click to make the bar disappear from view. With the addition of alert bars, you get a more complete conversion toolkit, helping you turn more clicks into customers and make the most of every web visitor who comes across your content. Building a business? 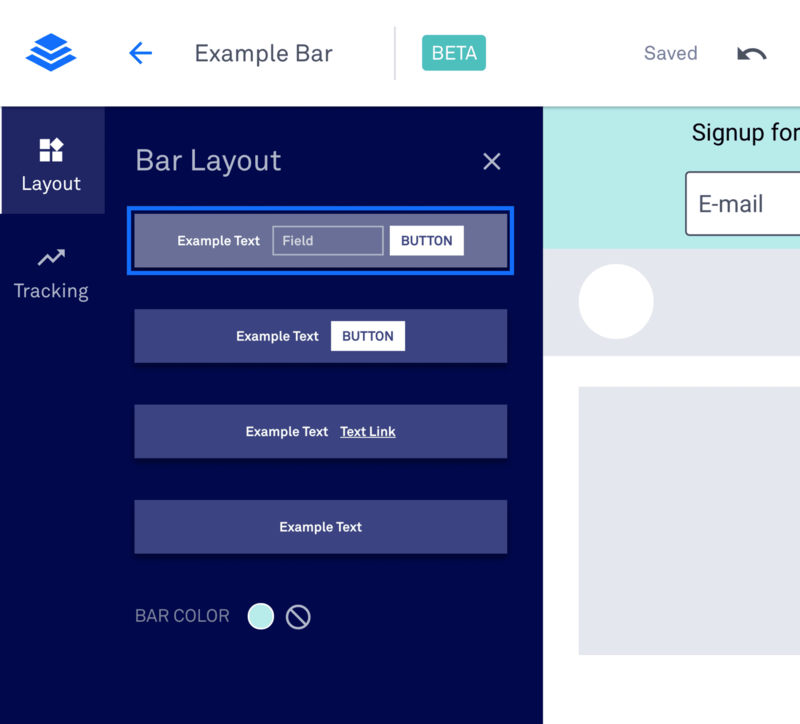 Add alert bars to your conversion toolkit. Sometimes known as sticky bars, announcement bars, hello bars, or floating bars—these slim banners bring lots of flexibility to your inbound marketing. Running a special discount or promotion? Put it front & center on your site to capture people with high intent to buy. Offering a trial or free consultation to help capture new customers? Use an alert bar to invite your site visitors to take advantage of the opportunity. Have a hot lead magnet? Highlight it in your bar! Include a simple opt-in form and CTA button to boost conversions and reduce bounce rates. You might decide to showcase a relevant lead magnet or content upgrade or invite visitors to subscribe to your newsletter. Whether you’re announcing a discount sale or sending traffic to a freshly published blog post, a banner will gets the headlines across without hindering a user’s experience. Worried your audience is unaware of your phenomenal social media channels? Invite them to click, friend, and follow your preferred platforms. As with everything else inside the Leadpages platform—we believe that the best tools should also be the easiest to use. Change the color of your bar, edit the text, include a hyperlink, opt-in form, and CTA button. Every element is fully customizable to help you stay on-brand and bring something unique to your audience. Start with a pre-designed, mobile-responsive layout that will remain sticky to the top of your website (for desktop) and sticky to the bottom (for mobile users). Wherever you’re driving web traffic is where you want your content to be conversion-optimized. Once you’ve customized your bar, publishing is easy: all it takes is two clicks to grab your cut & paste embed code. Add your embed code to the page tracking analytics section by pasting directly into the section labeled “Immediately before the closing <body> tag.” Then, simply click Save and Update your page. Whether you’re using WordPress, Squarespace, Wix, or a custom-built website—you can bring your bar with you. Simply grab the same embed code and paste it before the closing </body> tag on your site or blog. Automatically route your new subscribers directly to your email list or segment within your preferred email app. 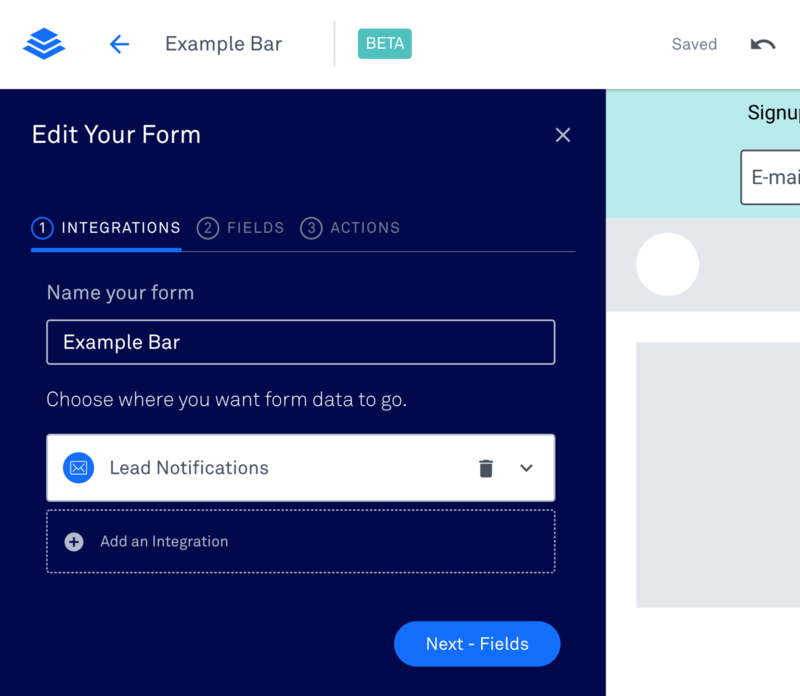 Easily connect your apps and set up an integration by hovering over your opt-in form and clicking ‘Edit Integrations’ or by clicking the form field or call-to-action button. You can even choose where you’d like to send your visitors after they opt in to your bar as well as attach a lead magnet. Bars remain sticky as a visitor scrolls on your page and can be closed by clicking the X at the right of the bar. Bars stick to the bottom of mobile browsers by default as the bottom of a mobile device’s display is most easily accessible. Ready to raise the bar for your business? From the very earliest days of Leadpages, we’ve let small businesses guide the creation of new tools and the evolution of our lead generation platform. We’re constantly changing—but that’s one thing that’s always going to remain: our commitment to equipping entrepreneurs with the tools they need to grow. Ok—time to hand it over to you. The alert bar is yours!